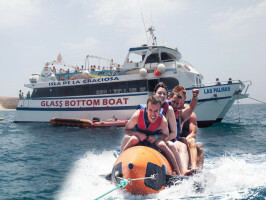 Sail around the paradisiacal beaches of Papagayo on a boat with glass bottom. 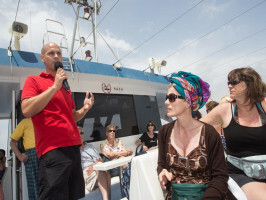 Have fun with different water activities and enjoy free food and drinks on board. 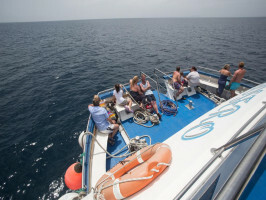 A coach will pick you up at the point closest to your hotel and will carry you to Playa Blanca, where you will board a boat with an underwater view. We will sail following the coast and skirting around the paradisiacal beaches of Papagayo. We will anchor near the coast. 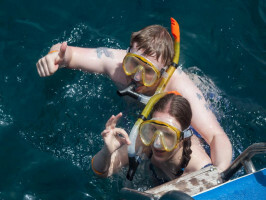 You can practice different water activities, such as snorkeling, kayaking or relaxing on inflatable mattresses. 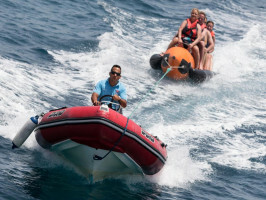 You can also have fun on a banana boat! On board, you’ll also enjoy a hot meal with fried chicken, potatoes, salad and bread, and free beer, sangria, water and soft drinks. Afterwards, you will sail back to Playa Blanca. Then a coach will take you back to the pick-up point closest to your hotel. 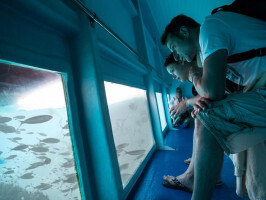 Boat with an underwater view, enjoy a relaxing cruise and discover the seabed of the Atlantic Ocean. Banana Boat: Have fun riding on the inflatable banana and don’t stop laughing. Diving: Immerse yourself in the waters of the beaches of Papagayo and be amazed by its stunning seabed. 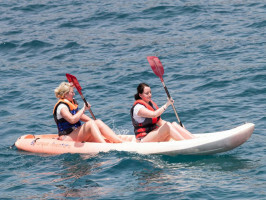 Kayak: Discover the coast step by step and explore virgin corners aboard a small rowing boat. Passport or ID are required. Children under the age of 14 are not required to present the ID or any other documents. The persons under whose guardianship they travel will be responsible for the minors. Please use comfortable clothes, bathing suit, sunglasses, biodegradable sun block and towels.